If you know Alaa's case, you can skip this recap and jump to the horizontal line below. If you watched the interview with Yousri Fouda on OnTv, you can skip this post entirely. Alaa was released on remand on Sunday 25th of December after spending 56 days in custody. Along with 27 other suspects who were accused of attacking the Maspero building and army forces protecting it. Read the full list of accusations here. What happened on the 9th of October was that the Army attacked a peaceful march with extreme force, opening live fire on men, women and children and used at least 2 APCs to run over protesters. Around 27 protesters died and 1 soldier was killed with a bullet. After the deadly attack the protesters managed to burn an APC and clashes took place for few hours following the deadly episode. You can read a first hand account of what happened here. You can also watch this video by Mosireen about the events. Alaa heard of the events over twitter and went to Abdelmoneim Reyad square, near Maspero, where he joined, well after the deadly events took place, the crowds chanting against SCAF. In one video he was filmed throwing a stone into blackness. Presumably at the police. He later went to the morgue of the Coptic hospital, where he instantly became useful. He spent the night their with the families of the deceased and helped them take the decision to allow for forensic autopsy and delay prayer and burial. 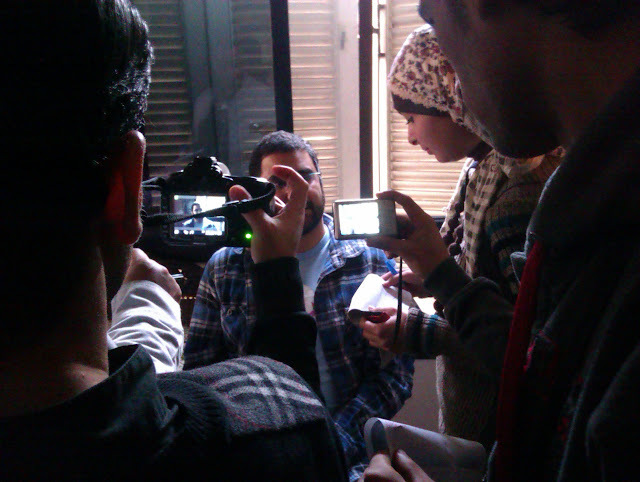 The Maspero massacre was followed by a media storm. Both national and international, with the most serious accusations against SCAF to date. Although, state media played it down and tried to spread fear, uncertainty and doubt in to the story. Foreign elements, hidden hands and on the same day they even accused copts of attacking the army which incited an angry mob to attack them. Alaa also wrote a powerful and moving op-ed in Sherouk newspaper about the experiences of the families and his own at the morgue. This was the second time, he says, that he lost someone he knows personally. This time it was the activist Mina Danial. The media scandals that followed didn't end, now an important feature of the revolution follows every violent attack by the state. SCAF held a rubbish press conference that made things worse. Probably, a part of their campaign against activists like Alaa who helped convince the families allow for autopsy. Someone called Hanan Khawasek wrote a testimony in Wafd newspaper saying that she saw Alaa stealing weapons and beating soldiers and other unbelievable Hollywood style blockbuster violence on that day. Days later, while outside the country, he was summoned to the military prosecution based on Khawasek's testimony. He returned and turned himself in, but refused to cooperate with the prosecution. Stating that he is a civilian and has the right to be tried in a civilian court and that the military is a party in the case and accused of murder and the military prosecution can't investigate itself. This is when the military prosecution decided to detain him for 15 days and later on, due to pressure and the Mohamed Mahmmoud events, the case was transferred to a civilian (yet exceptional) state security court. Alaa's detention was renewed twice afterwards and then released. The following are what I managed to live tweet during his appearance with Yousri Fouda late at night yesterday. He appeared first and later activist and doctor Ahmed Harara joined the show. Yousri reminds @alaa & viewers that the case is still pending and he is still out on remand. Asks him 30 years from now how will history remember his episode. @alaa says he hopes all the sacrifices and contributions of millions will be remembered. Alaa: what is rarely mentioned about jail is how slow and boring life is meanwhile events outside are accelerating. Revolution is back to the squares and martyrs falling. State media was only outlet for information which displayed protesters as criminals attacking buildings etc.. but never shows who the other side is but they say protesters are getting injured and dying. Alaa: the solidarity from everywhere reached me from papers and telegrams. Sister had a notepad to tell me about support from people quickly during visits. Alaa: I cant thank everyone for the solidarity and support. Alaa: Maikel Nabil is the first one who stood against military trials and considered them a farce. Due to circumstances he didn't get same publicity. Alaa: Maikel is paying a very high price for his solid stance. His case is clearly about his opinions and what he wrote. Alaa: even people who didn't trust SCAF never imagined that the situation reaches this level. We passed through phases of denial .. In the beginning people thought these were mistakes. But then even my friend who was restricting the circulation of testimony said publish it. Alaa: army's good position was inflated both officially by media and by people. Ontv showing well known people declaring their support to his case who appeared on the show in the past two months. Including salafis &MB. 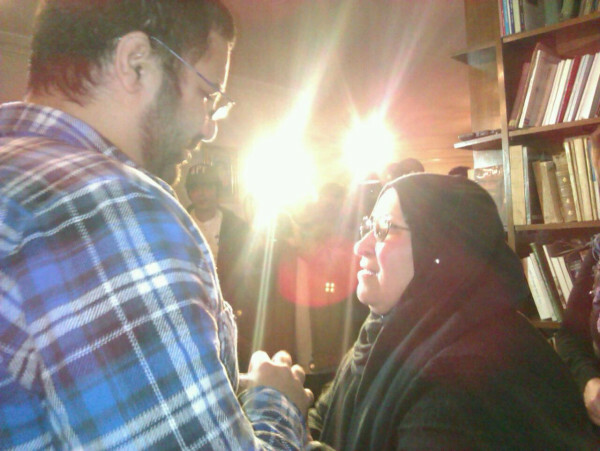 Alaa: I knew that due to media attention and being known I won't be tortured. What I did wasn't heroic, I sort of knew what I was going through but surely they can be unpredictable. All other suspects were tortured. Now showing tweets from @alaa during the Maspero events and afterwards proving that he was there afterwards the deadly attacks happened. On the phone Ahmed Seif (Alaa's father and lawyer): optimistic about the case, judge heard the witnesses and isn't satisfied by investigation done by military prosecution which means that an investigation will go on. Judge will also give us a time frame for his investigations and this is a very positive sign and may mean we may exclude many suspects. We want to reach the point of accusing the real killers.. youssri interrupts..
Ahmed Saif: our priority is to finish this case and if alaa is no longer a suspect doesn't mean we will not leave the others accused. Y: EIPR says only 3 soldiers are now suspects in running over protesters but shooting accusations overlooked. AS:prosecution trying to close the case. Alaa: the 3 soldiers are scapegoats. They are trying to convince us that the investigations are serious. Just like the 'eye sniper' case the prosecution is ignoring those who gave the ordered. And this has been the case forever what is new is SCAF is offering scapegoats from the army. We need to be able to put such authorities under scrutiny and in front of the legal system including generals Hamdy Badeen & Roweiny. Youssri asking about what Alaa wrote in prison. Alaa: at first I was in a 3x2 dark dirty cell with 9 people we had to take shifts for who would sleep and who would sit. Alaa: We could have improved the cleanliness and brought in wire and light bulb without any effort from prison but this was denied. Alaa: the usual prison day for other inmates includes slapping insults and beatigns and if old means negligence for health conditions..
Another never ending ad break. Ahmed Harara joins. Ahmed Harara is a dr who lost his eye on Jan28 and second one on 18nov by police fire. Now showing video of Harara amidst a huge crowd welcoming him at airport after he returned from a failed trip to France to save his 2nd eye. In my opinion, Harara appeared very cheerful. Alaa: when I knew about Malek, Harara and Ahmed Fatah's injury I felt very sad and shocked. Harara: human rights organisations are the ones who ran to help the injured. (Government committee does nothing). Alaa in #tahrir: stability will come with justice. Photos of Harara visiting Alaa and Khaled Said's mother hugging Alaa. Harara: 18 days passed with people committees protecting people. If justice comes things will calm down. If law is applied over everyone the country will improve. We said cleanse the interior ministry, media etc..
Harara: do people know what the Abbesseya people are saying? Chanting for mubarak and against tahrir woman? Hamdin Sabahy on the phone: I am proud of Harara and @alaa who always says the empror has no clothes. They are Egypts true heart, etc..
Sabahi is saying nice stuff about hearts and hopes and prayers etc..
Sabahi was very boring. Thankfully the line died. Alaa: The revolution started with hope. We saw Tunisia and we had lots activism. But people didn't want to sacrifice with no result. Alaa: #Tahrir isn't the complete story of the revolution but strikes, people trying to get gas cylinders or surrounding polluting factories are part of the revolution. Meanwhile, some of them are cursing the revolution we need to find a way to reach out and explain that we are all part of the process. Alaa and Harara were still going on after an ad break. Sister of Ziad Bakir (martyr) is on the phone. But I got busy and couldn't continue live tweeting.